The future when people will come home after work and ask their TV to turn on and the washing machine to wash clothes in the economy mode doesn’t seem so distant. We can already talk to virtual assistants like Siri or Alexa to search for a movie or order a new scarf with delivery at door. Why not doing the same thing with everything else? In fact, this is what everyone now calls the Internet of Things which is according to Wikipedia basically the network of physical devices, vehicles, home appliances, and other items embedded with electronics, software, sensors, actuators, and connectivity which enables these things to connect, collect and exchange data. 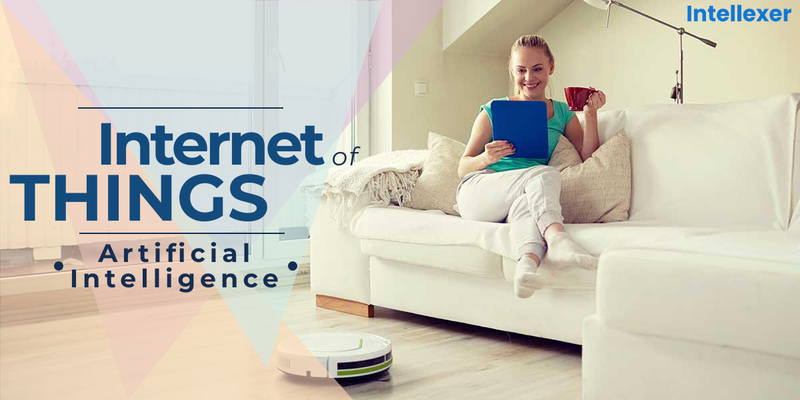 In its essence, the technology of IoT is about devices with built-in sensors, which provide data to one or more central locations through internet connectivity. That data is then analyzed and corresponding actions are initiated. For any IoT service to be worth buying, such actions must demonstrate true value and yield benefit to the user. Of course, they vary from adequate physical actions (e.g. deploying a taxi to the site) to simply informing users (e.g. sending a message to inform a user that they have run out of milk). It is here at the data analysis step, that the true value of any IoT application is determined, and this is where Artificial Intelligence provides a crucial role by making sense of data streamed from devices. AI serves to detect patterns in this data from which it can learn to adjust the behavior of IoT service. Probably the best example of AI and IoT successfully working together is self-driving cars by Tesla Motors. Cars act as “things” and use the power of Artificial Intelligence to predict the behavior of cars and pedestrians in various circumstances. Moreover, all Tesla cars operate as a network. When one car learns something, they all learn it. Automated vacuum cleaners are a good example of artificial intelligence “embodied” in a robot. For example, iRobot by Roomba controlled through an app can map and “remember” a home layout, adapt to different surfaces or new items, clean a room with the most efficient movement pattern, and dock itself to recharge its batteries. Another good example of AI and IoT combined together is a smart thermostat solution by Nest Labs. Nest’s smartphone integration allows to check and control temperature from anywhere. The device analyzes temperature preferences and work schedule of its users and adapts temperature accordingly. Applications, where IoT works together with AI, are only growing, creating new markets and opportunities and they are highly unlikely to lose ground in the nearest future. Intelligent platform based on ML and NLP algorithms for deep text analysis.